Is it a scare, a bad rumor that has gone wrong, or a horrifying truth which we may be unable to deal with? The fear of the President selling out Taiwan’s sovereignty is rising in numbers by the week. Can anyone find rest in this matter? Premier Liu Chao-Shiuan (劉兆玄) on Tuesday, February 24, the allegations of a set timetable for unification in 2016. Wu Ching-Chih is the Chinese Nationalist Party‘s (KMT). What initiated such a strong response? Taiwan's President-elect Ma Ying-jeou speaks during an exclusive interview with The Associated Press at the Nationalist Party headquarters, Thursday, May 15, 2008, in Taipei, Taiwan. Ma said that unification with longtime rival China is unlikely to happen "in our lifetimes." Ma begins his term as president on Tuesday, May 20, 2008. Apparently, Wu had asked Liu if the President’s (Ma Ying-Jeou) government had intentions in planning a unification with China in 2016, as mentioned by Taiwan Solidarity Union (TSU) Chairman, Huang Kun-Huei (黃昆輝). Huang had revealed, in speaking with reporters, that he personally believes that Chin would refrain from such political topics during Ma’s current term, in order gain his re-election in 2012. In this thought, China’s capital (Beijing) could assume political pressures on Ma following a possible re-election for the unification within the final year of his second term in office, says Huang. Liu disagrees and comments that he does not understand why Huang would initiate such claims. Regardless, Wu urged the National Security Council (NSC) and the National Security Bureau (NSB) to investigate into the matter and to search for any plausible documentations. In the KMT’s defense, Liu insisted that the government had no such timetable for a Comprehensive Economic Cooperation Agreement (CECA) with China either. The current plan to pursue the agreement has already created a major uproar with the public over the idea of compromising Taiwan’s sovereignty. According to the President, he does not wish to re-instate the National Unification Council (NUC), which was originally abolished by the former President, Chen Shui-Bian. Towards the closing of the March 22 presidential elections, Hong Kong-born Ma repeatedly affirms his words in safeguarding the status quo of the Taiwan Strait. Chairman Huang announced Thursday, February 26 that by officializing the CECA with China would be like giving “free lunch” to businesses while the majority of labourers would suffer. “There is no such thing as a free lunch,” said Huang, standing firm. (Photo, courtesy of TAIPEI TIMES, by Lo Pei-Der) Taiwan Solidarity Union Chairman Huang Kun-huei addresses a press conference called in Taipei yesterday after two of the party's legislators threatened to quit. In press conference, the Chairman raised these issues (of 11 questions which are related to the CECA) and requested Ma to address them in a television interview this Friday, February 27 with an unspecified TV network. Presidential Spokesman, Wang Yu-Chi announced Tuesday, February 24 that there would be no discussion of the CECA in the broadcasted interview. However, Wang continues, if asked on the subject, he will answer. The President chose not to comment on the issue because he believes public debate is not necessary over naming the arrangement and what should be stipulated. It seems like Ma is doing a yo-yo routine over listening to the people and benefiting the nation through such actions. Are we getting another George W. Bush? Huang suggests that instead of creating fear among the public with the argument of the economic situation of the nation would be dire if failed to allow the CECA to pass with Beijing, the President should clearly state – once and for all – a transparent detailed explanation to the people on its contents, concept and consequences upon signing such an agreement. The opposition, Democratic Progressive Party (DPP), would most likely initiate a public census as a public suggestion to Ma. TSU heavy weights have argued before that such an agreement, which would affect all lives on either side of the Strait, should at the least be discussed with the Legislative Yuan, subjected to legislative review and referendum before setting out onto the negotiation table with China. “In light of China’s ultimate goal to annex Taiwan — not so much a conspiracy or anything — a referendum is necessary, since this is a matter of the long-term survival and development of the entire Taiwanese society,” stated Huang. He continues to argue on the matter that the agreement should only be signed under the condition that China gives sound word to resolve numerous cases in problems with Taiwanese business with investment in China. Oddly enough, the Ma Administration has repeatedly compared the CECA to the economic integration of the European Union (EU), explaining that it has nothing to do with political issues and sovereignty. In response to the statement, Huang follows with the idea: the President should follow the example and hold a referendum on the matter. Not the Taiwanese businesspersons in Beijing, but media and political representatives. China’s capital announced that the government welcomes any visitors embracing a peaceful approach to the Cross Strait relations, according to a Chinese official Wednesday, February 25. (Photo, courtesy of BBC News) Taiwan head seeks Beijing talks. KMT leader, Lien Chan, is shown here, paying respects at his grandmother's grave. Annette Lu is the former Vice President of Taiwan and Pro-Independence supporter. People are watching, listening and above all waiting: if the capital accepts the former Vice President’s arrival, it would be accepted as a first step on their part in softening their stance not only towards the island, but the former President (and herself included) as well. How would this change the Cross Strait relations, if at all? In the past, the capital have voiced their hesitation and insisted that the Independence supporters renounce Taiwan independence before any visit would be considered. China’s stance on Taiwan’s sovereignce, to this date, still has not changed. Should visits and compromise not work both ways? We have numerous Communist and Pro-China supporters in Taiwan, entered with no interference from the government, unless if engaged in illegal conduct. Shao Qi-Wei is Director of China’s National Tourism Administration, lead a group of Chinese tourism representatives to Taipei on Wednesday, February 25 in attendance of the 12th meeting of exchanges between the tourism industries of the Strait. This meeting is held for the first time in over a decade, indicating a form of normalcy for tourism on both sides. (Photo, courtesy of the CNA) Shao Qiwei, 2nd from left, director of China National Tourism Administration, waves upon arriving at Taoyuan International Airport yesterday as head of a tourism delegation from China. The delegation will attend a meeting that opens today, and tour the island during their stay. “This is my third visit to Taiwan. My first visit here was made in Autumn, the second in Summer, and this time in Spring. I’m glad to see the great sunshine and beautiful, natural Spring landscape here,” complimented Shao. In this visit, Shao leads 458 Chinese tourism delegations to 12th Cross Strait Tourism Exchange Meeting. After the meeting, the group toured around scenic areas and tourist attractions , to determine optimal travel routes for Taiwan-bound tourist groups the delegations will organize, this according to the group leader. “I hope both sides across the Strait can, via face-to-face negotiations, can jointly work out effective measures to promote cross-strait tourist travel amid the global financial crisis, and establish a bilateral tourism promotion mechanism.” explains Shao. Following is an exerpt from the CNA. MOSQUITO EATER: Elbowed out of its habitat by foreign species and pollution, the near-extinct fish was made a protected species in 1990 and now has a second chance. (Photo, courtesy of CNA) A paradise fish, a small freshwater fish that was once commonly found in rivers and creeks around Taiwan, swims in a breeding pool yesterday. The fish is almost extinct in the wild because of pollution and competition from other fish, but one breeding station in Hualien County has succeeded in breeding the species in captivity. Paradise Fish — a small freshwater fish once commonly found in rivers and creeks around Taiwan — may be nearly extinct in the wild, but one fish breeding station has been successfully breeding the species in captivity. Lin Hung-Kuei (林鴻桂), director of Hualien County’s Fish Breeding Propagation Station, said that pollution and competitive non-indigenous fish had driven the paradise fish from its natural breeding places and made it almost impossible to reintroduce it into the wild to replenish stocks. After the fish was designated by the government as a protected species in August 1990, the station began studying ways to help revive the species and has successfully bred the fish in a controlled environment and preserved the species, which is endemic to Taiwan. The breeding technique is now being shared with schools for use as a tool in experimental ponds, Lin said. Paradise fish, also known as Macropodus Opercularis, are approximately 6cm long and live in shallow freshwater environments where water flow is gentle. 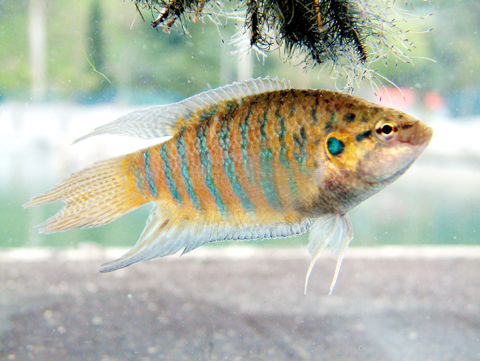 The fish breeding station said that although they are rarely seen in the wild, with their green-blue and light red stripes, paradise fish are popular in private fish tanks. Lin said that most paradise fish traded in the market were bred artificially, while some are imported from Malaysia. Aside from being appreciated for its appearance, the fish can also be used to eradicate mosquitoes as it eats their larva. These small freshwater labyrinth fish can be found within ditches and paddy fields throughout East Asia, ranging from the Korean Peninsula to Northern Vietnam, Taiwan and Malaysia. This species is unique in that it was reported to have been one of the first ornamental fishes kept and adored by western aquarium keepers, having been imported to various European countries in the 1800’s A.D.E. These are similar to the beta fishes in their aggressiveness and have been known to fight to the death when one male encounters the other, they are territorial. The Paradise Fish is more aggressive than the Blue Gourami, however less than the rare Combtail. These fishes are unique as well for their capability to take air directly from the surface of the water, due to the respiratory organ, known as labyrinth. Another unique feature is of creating a ‘bubble nest‘ for the nesting of their young, although the female should be parted from the nest for she will consume them for nutrition. Once the eggs have spawned, the male should be removed as well, for he will consume them once this process occurs. These fishes are mighty jumpers! If kept in an aquarium, make it mandatory to leave the cover over it, they are known to have leapt to their death. In photo-documentation, they turn full black, once deceased. The photo depicts a pair of Paradise Fish in the process of mating. The mail encircles the female, into a shape of U. Once commonly found in local creeks and rivers, are now disappearing, due to chemical pollution in the waters. One fish-breeding station, however, is determined to revive the once flourishing species. Factors contributing to the disappearance are: pollution and introduction of competitive immigrant fishes. The combination have driven the native fish from their natural breeding habitat and made it almost impossible to return them back into nature. Upon designation by the government as a protected species, in August 1990, the station produced great effort in assisting the reproduction. The process has been successful, the station’s staff breeded the fish within an observed and controlled environment, to preserve the species in Taiwan. The breeding technique has been passed down into the education system through habitat observations with man-made ponds. A benefit to populating the species is for their habit of eating mosquitoes and their larvas. A Paradise Fish is seen here in mid-action, leaping from one puddle to another. Most of this breed live in very warm, or room temperature water. The only problem is, the higher the temperature of the water, the less oxygen it holds. Yet, oddly enough, this is the time the mating season begins, as the fishes believe it to be the Summer season. Their habitat generally contains a considerable amount of rotting vegetation, which further reduces the oxygen level. Their labyrinth enables them to thrive in such conditions, which with other general fishes, would be a hostile environment. A unique attribute to this is their adaptation: they come up to the surface of water, for their air intake. In other words, they breathe air. Paradise Fishes thrive in skuzzy water that attracts mosquitoes, like puddles, still-water ponds, buckets partially full of rainwater and vegetation, such as leaves and small twigs. This environment, though pleasant for the Paradise Fish, may be very uncomfortable for us. 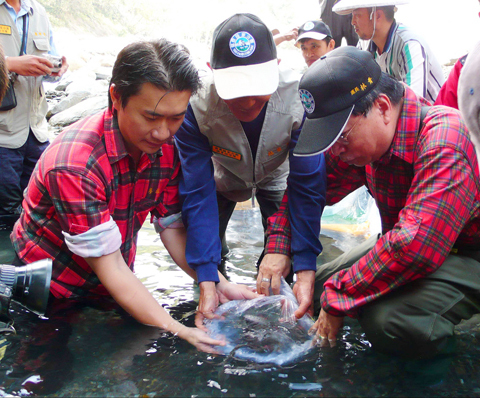 (Photo, courtesy of TAIPEI TIMES, by Chang Hsuan-Che) Workers with the Shei-Pa National Park Administration Center release Formosan landlocked salmon fry into the streams of Shei-Pa National Park in 2007. Another kept under a close observation is the Formosan Salmon. The fish is known by many names: Oncorhynchus masou, Formosan salmon or even Taiwan trout. The Formosan Salmon can today be seen swimming along the Chi Chia Wan Stream, thanks to having attracted the attention of biogeographers and zoologists since first sighted in 1916. Extinction: over-fishing, development along the streambanks and the construction of highways endangered their population and became alarmingly scarce. In the early days, it was a much prized, major food source for the Aborigines. (Photo, courtesy of np.cpami.gov.tw , by Yu Jheng-Hao) Shown in the photo, are eggs of the Formosan land-locked Salmon. “The aborigines would catch the fish by means of poisoning, bombing, or electrifying,” said Tang Shiao-Yu, senior specialist of the Conservation Division of the Council of Agriculture (COA). 1984: The species fell under wildlife species protection under Taiwan’s Law for the Conservation of Cultural Heritage. They became so protected, in fact, poachers received a three-year prison term. (Photo, courtesy of Wu-Ling Farm) Formosan Landlocked Salmon is a global salmon and trout species distributed in a more southern region. Therefore, for having this kind of fish in Taiwan that is in the subtropical zone, it is really special. At the time, the population decreased to a mere 200, however through the protection program, it has grown by the ten-folds. This canivorous fish enjoys thriving on water insects and the Chi Chia Wan Stream is the perfect habitat, considering its home environment is that of pollution-free water, under 16 degrees (Celcius). Like any other salmon, this one is as well known for swimming upstream for the process of spawning, however have only recently adopted a new routine. They have been land-locked due to environmental changes: once flat rivers turn precipitous, the steam of the rivers were altered. These factors and global warming (change in water temperature) impacted their natural instinct. In their breeding period varying from early October to late November, the males would build breeding hatches within the area of shallw streambeds and the female would spawn in the hatches. It is believed to be the only Salmon of its kind, not to sweam upwards, against the stream. On Monday, February 23, a group of social welfare activists criticized the current government plan and policy on long-term care insurance program (which is paid for and provided to, by all citizens). Currently, the project is expected to cost us over NTD $50 billion annually, it’s initiative is to reduce the burden on families caring for their elderlies. It was either through raising or adding taxes on the people, despite the poor economy so the government may care for the elderlies so other family members may continue to work, or leave it up to the people to care for their own, risking neglect and abuse. It may not be a flawless plan, however is the best choice. The government had a thought: instead of raising taxes or insurance premiums to finance the program, they could draw from the available tax revenue to build a care foundation and recruit staff members – according to the Senior Citizens Welfare Alliance, Wu Yu-Chin. Wu explains that the government has not been able to obtain enough detains on the plans, largely due to the unavailable information in the size of the premiums, starting age to be accepted into the premium [payments], and target areas of the programs. Yang Chih-Liang is the former Deputy Director to the Department of Health. Monday, Yang responded to the critics for not wishing to participate in the assisting of elderly citizens (who are in need of secondary assistance). He says, the only other available alternative would be to have the senior citizens assisted by one relative each. With today’s housing requiring payment of two incomes, and work hours ranging from as little as eight hours a day to 12, direct, proper care my not be available. This is a dangerous issue. (Photo, courtesy of gio.gov.tw) Taiwan's Public Health: Thanks to the Rare Disease and Orphan Drug Act, people with rare diseases are guaranteed medication and nutritious foods under the country’s universal National Health Insurance. The ROC is one of only five nations to pass such legislation. Yang believes that no matter the family situation, finance and availability, all citizens should be included in long-term care insurance, especially with cases such as children with grave diseases who require mandatory, permanent hospitalization, or care. The current program allows the government to use the available tax revenue for its funding, however in doing so would still eventually raise taxes – which is an alarming topic, considering the economic crisis. There are only two options, considering the situation. Continue the present system in passing the responsibility to family members in caring for their elderlies. Current government plans offer beneficiaries of long-term care insurance include the elderlies unable to perform three of the six “activities of daily living” unassisted. Activities include, but are not limited to: eating, dressing, bathing, self-attending to bathroom needs, getting in or out of bed or their seat, and the capability of [effortless] walking. The system’s policy may grow lenient to include those unable to prepare food, hold poor [short or long term] memories, unable to open a bag or zipper, unable to purchase groceries or perform bank transactions. The plan is under review and is looking to have a proposal ready by June 2010. The Legislative Yuan is investigating the matter by the end of the year with a launch scheduled toward sometimes in 2011. The news has fueled fire, the people are raging. Taiwan’s Department of Health’s attempts to increase National Health Insurance (NHI) premiums. The Department’s Minister, Yeh Ching-Chuan (葉金川), announced last week, “the 1.5 Generation NHI Act” would be on pause, until the state of the economy revives. Is Taiwan a model for the US health care reform? Many say, yes: Taiwan does seems to have the ideal health care plan with nearly universal coverage, no waiting periods except for organ transplants and cost efficiency. Executive Yuan referred to several agencies, including the Health Department, the Council for Economic Planning and Development and the Ministry of the Interior, in considering a proposal on long term care for the elderly and disabled. Yang Chih-Liang (楊志良) is the Vice President of the Tai-Chung Healthcare and Management University as well as participant in revising the proposal. Yang presses the issue, stating that the plan is “urgently needed.” Who knows what damage waiting for the economy to stimulate itself could do to the neglected or mistreated elderlies. Current demographics reveal that 10% of the Taiwanese population is of senior age (65 years and older), which is about to increase to 22% by 2020. “The rate at which our population is aging is even faster than Japan – we rank No. 1 in the world [for the rate of aging] … Even if we do it now, it may already be too late,” stresses Yang. He said a long term care program would beneficially target those who require the care, the physically or mentally disabled, and the elderlies. The Funds: The program would cost every working citizen to contribute a mere 1% of their monthly salary. Why is this so hard, why can’t the masses accept this 1%? “Like the NHI, low-income families would receive subsidies or be exempted from paying the new premium,” explains Yang, “For the general public, the rate would be about 1/6 or 1/7 of their NHI contribution,” or of which equals to 1% of their income. He hopes that through the program, everyone could participate in preparation for their senior age and eliminate problems such as the increase in the homeless. Social Security, Medicaid and Medicare was a mere stick-on band-aid to help the current older generations in the United States, working only as a temporary solution, however resulted in adding onto the already trillion-dollar debt in the government. CNN speaks on the negative effects of Social Security in the United States. By the time the current mid-age population reaches retirement, the government would have no available funding to assist the future seniors, and would have the population to fend for themselves. An example, in looking into a small percent of how the future would be, at the moment senior citizens are pulling out of retirement and into the part-time work field (as it is all that’s currently available in their position), just to be able to survive day-to-day and continue with their daily activities. The retirement program should not push senior citizens into the work field after dedicating much of their lives working and paying taxes to the government. Part of the reason we pay taxes in our income is to support the government to look after our retirement as well as current senior population. The pyramid has turned into an hour glass: The middle class have shifted into the struggling class, the struggling class into poverty, the poverty into the homeless, and the demographics on the number of homeless people have become alarmingly high. What ever happened to the American idea of subsidizing? Blind Leading the Blind: A lot is due to the loss in the stock market and like “investments” as we can see with what we once believed was a secure way of banking: the HSBC (Hong Kong-Shanghai-Bank-Cooperation). (Photo, courtesy of dailymail) HSBC says it 'cannot envisage circumstances' where it would seek funds from the government: The Asset Protection Scheme of the Government's latest rescue plan for the finance sector paves the way for taxpayers to take shares in British banks, including HSBC, to insure the banks against hundreds of billions of pounds of losses on toxic loans. With banks and car dealerships closing by the numbers, many are unable to see their investment again, not to mention still having to pay their mortgage. While the masses of the baby boom generation are licking their wounds and looking to the newly elected President Barack Obama and the Congress for a sound, secure retirement – the opposite, instead, seems to occur. However, there is help: President Obama may be able to boost the economy without going through Congress through reaffirming his support for Social Security and assure those nearing retirement, that he will not allow their benefits to be deducted. Peter Peterson is a billionaire banker who finances the program. Peterson has spent the past two decades, attempting to deduct from the Social Security, Medicare and such benefits for the seniors and have recently contributed a billion dollars to a foundation (which bears his name), as promoting his goal. Current baby boomers has paid into Social Security at the current stated 12.4% tax rate for their entire work-life, only to end being forced to wait until 66 or 67 to reap full benefits. The average returns are visually less than the previous generations that follow far below than the generations that preceded them. Much of the USD $8 trillion is lost and debted from the housing bubble, which affected the invested baby boomers, as likewise with the $7 trillion in wealth lost in the stock market crash. The US is looking for a solution from within the problem may not work. Many believe that through such action would only raise the debt and doom the later generations and new retirees. Why repair something that did not work? A band-aid is no solution. Banks are not even safe anymore and the American people no longer believe in the idea of credit. (Photo, courtesy of Washington Independent) Sometime during the week-end of March 14-15, 2008, the U.S. Federal Reserve decided the government of the United States could not permit the investment bank Bear Stearns to fail. Ben Bernanke, the Fed chairman, told the Senate Banking Committee that the bailout of Bear Stearns was necessary to protect the financial system and, ultimately, the entire economy. The coming challenge of paying Social Security, Medicare, and Medicaid benefits to 77 million retiring baby boomers will be one of the greatest economic challenges of the 21st century. What Federal Reserve chairman Ben Bernanke called the “calm before the storm” ended on January 1, 2009, when the first baby boomers became eligible for Social Security benefits. In three years, they will also become eligible for Medicare. In the coming decades, the cost of these programs will leap from 8.4 percent of gross domestic product (GDP) to 18.6 percent of GDP—an increase of 10.2 percent of GDP. Without reform, this increased cost would require raising taxes by the current equiva­lent of $12,072 per household or eliminating every other government program. Funding all of the prom­ised benefits with income taxes would require rais­ing the 35 percent income tax bracket to at least 77 percent and raising the 25 percent tax bracket to at least 55 percent. The Congressional Budget Office (CBO) projects that federal spending in Social Security, Medicare and Medicaid will leap from 8.4 percent by 2050 … This massive cost increase will be fueled by the 77 million retiring baby boomers, combined with steep inflation in health care costs and an automatic scheduled benefit hikes. These costs far exceed what taxpayers will be able to afford. Increasing taxes by 10.2 percent of GDP today would come to $1.394 trillion, or $12,072 per household. It could mean raising income tax rates by at least 120% – and probably more because tax increase slow economic growth and dampen new revenues – with additional thereafter. Funding of all the promised benefits would require raising the 35 percent income tax bracket to at least 77 percent and the 25 percent tax bracket to at least 55 percent. Regrettably, five common myths undermine the cause for immediate action. One man has even gone to the extent of asking the police to send him to jail (again), in order to reap benefits of paying taxes: free bed and meal. (Photo, courtesy of daylife) A man looks at the posters of job information at an employment service centre in Taipei February 4, 2009. 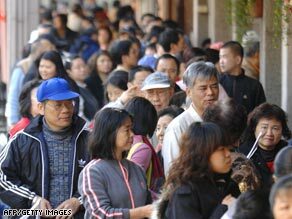 Taiwan government has been implementing measures to try to lower its jobless rate which hit a half-year high in December. The Chinese characters on the left read, "Tips to find a job." Surname Wang, age 45, has been jailed for over 10 years on 12 arson charges before being released three years ago. Since the release, he has been unable to find employment even with attempts in visiting the Taipei Employment Service Centre, only to be rejected with each visit. Sunday, February 22 early morning, patrol police reported having found Wang laying in a street corner in Xi-Men-Ting of downtown Taipei. In response, the officer was kind enough to have bought Wang a box meal and with an introduction to a borough leader who promised Wang a job as street-cleaner. Are You Sane Enough To Be Unemployed? : According to Civic groups and Doctors on Monday, February 23, the problem of unemployment is greater among those affected with mental health problems, with an astounding recorded 66% left unemployed in 2008. Eva Tseng (滕西華) is Project Director. Tseng reports that the issue of nationwide unemployment has worsened, which proves a greater challenge for the mentally ill.
“About 20% to 30% of the mentally ill are [involuntarily] unemployed,” she explains. Taipei City Mayor, Hau Lung-Bin, is helping a total of 437 families in Taipei City, as they are eligible in receiving yet another voucher. Each household are reported eligible to receive NTD $5,000 (equivalent of USD $144) in the first batch, issued by the Taipei City Government, this coming March 1st to families in need. The municipal Bureau of Civil Affairs approved the interviewed 82.3%, or: 531 families, 437 households, to receive the food vouchers as the first delivery of its kind. According to Mayor Hau, 1,134 families who have applied can claim the subsidy after the city government unveiled the plan in January 22, in attempt to help turn the economy. The bureau plans to deliver all NTD $5,000 worth of food vouchers to every one of the 10,000 households within the initial stage of the program, which is reported to last up until the last day of this year. In the next follow-up stages, more families will be included, says the bureau officials. (Photo, courtesy of Family Mart) Family Mart, a chain-convenience store that had originated from Japan, hs become popular in Taiwan as a growing competition against 7-Eleven. As helpful as the vouchers may be at this time, however they are a one-time handout and are limited to be spent on food such as lunch boxes, bread and rice balls – and only at Family Mart convenience stores. They are excluded from purchasing cigarettes, alcoholic beverages or magazines. Since KMT have changed their own image into a friendlier and a more lenient one, though they may not always follow general consensus or public opinion however, they have finally learned to listen. President Ma Ying-Jeou (馬英九) is considering the recommendations of the opposition, Democratic Progressive Party Sunday, February 22. (Photo, courtesy of E-Taiwan News) Democratic Progressive Party Chairwoman, Tsai Ing-Wen joined a prep-session on for Taiwan Citizen Conference on National Affairs. Tsai has invited President Ma to attend the conference, however, have been reported absent from the two-day conference. Presidential Spokesman, Wang Yu-Chi (王郁琦) calls the opposition’s recommendation, one of harsh planning. The two day meeting consisted talks in wake of its “National Policy Conference” with opposition Chairwoman, Tsai Ing-Wen (蔡英文). Tsai referred to the President as being “out of touch” with the public, hence the call to the meeting. The Spokesman specified that the government welcomes recommendations in the idea of improvising the comprehensive economic cooperation in the Cross Strait. This may be the next open, follow-up meeting, if included with the Legislative Yuan, the people (maximum allowed simultaneous view is 800) will be able to view the conference. The two-day held National Policy Conference is one huge step for either parties, and should be widely applauded by the people. (Photo, courtesy of CNA) Chairwoman Tsai Ing-Wen of the opposition Democratic Progressive Party told a press conference yesterday that DPP lawmakers will steer the legislative topics during the new legislative session, open February 20. In comparison, the United States holds three parties: Republican (1854), Democratic (1828 current, 1792 traditional) and Individual (Libertarian Party , Constitution Party , Green Party , i.e.). In general, however, despite which side a running candidate may be on, their ideal image of policies and nation-building construction derive from political mixture. Only through this observation, unity and acceptance can politics boost the national economy. Reviewing: The Chairwoman was sent, in response to the National Policy Conference, a one-on-one sit down meeting with the President to listen to the side of the Chinese Nationalist Party (KMT), as according to Spokesman Wang, would only be fair. Tsai has declined the invitation, however still pushing the open invitation. Opposition party, DPP held the conference to review the President’s decision, policies and effect on the nation since his inauguration. In conclusion, the opposition demands to receive appology in failure to meet his promise, and in effect, demands an impeachment and immediate Cabinet reshuffle. In a concluding speech, Tsai protests in stating that the President chose not to face the “realities” (of the public opinion, nor current state of the nation and economy), instead, chose to rush relations with China in signing a Comprehensive Economic Cooperation Arrangement (or CECA) with their capital, Beijing. “We demand Ma apologize and reshuffle the Cabinet,” said Tsai, during the closing ceremony, co-sponsored with the Taiwan Solidarity Union (or TSU, created by former President, Lee Teng-Hui (李登輝), which concluded with his banishment from the KMT party during his presidential term). (Photo, courtesy of CNA) Tsai Ing-Wen, Chairwoman of the Democratic Progressive Party (right), shakes hands with Taiwan Solidarity Union Chairman, Huang Kun-Hui. A two-day "National Policy Conference," co-sponsored by the two parties, have reached a conclusion Sunday, February 22. Tsai suggests that at least three Cabinet Ministers (Yin Chi-Ming (尹啟銘), Minister of Economic Affairs; Lee Sush-Der (李述德), Minister of Finance; and Chen Ching-Hsiou (陳清秀), Director-General of the Central Personnel Administration) must resign. Ten conclusions were reached, of which the Chairwoman says is first of a trio of her National Policy Conferences. The second conference will occur between the months of April and May, while the third and final conference will be arranged sometime in 2010. All arrived conclusions were of repetition of platitudes save the broadside fired at the KMT administration. “Such relations (between Taiwan and China) have to be conducted with perfect transparency” urged Tsai. She believes that there is no possibility in separating the economy from politics, in reference to the Taiwan Strait. “The Ma government should first propose a comprehensive review of Taiwan’s political economic relationship (prior to the signing of the CECA).” directed Tsai. Huang Kun-Hui (黃昆輝), in participation of the conference, is TSU’s Chairwoman. Huang refers the former President, Lee, as the party’s spiritual leader – and would initiate Ma’s recall upon signing the CECA. Presidents Ma and Lee, however, was *missing from participation. Despite their absence, however, both chairpersons considered the meeting a success. Its initial mission was to gather in reaching an overview of President Ma’s actions, and in effect, what conclusions should be reached. A needed consensus was reached, the Chairpersons oversaw the conduct of Cross Strait economic and trade relations, and lastly, launched a political social reform. According to Chairwoman Tsai, knowingly though pushing an impeachment on the President may fall through, it would still serve it’s point: the government needs to review the Cross Strait policies. (Photo, courtesy of TAIPEI TIMES, by Wang Min-Wei) Interior Minister, Lioa Liou-Yi (left), declines an invitation to sit among the VIP attendees to the Taiwan Citizen Conference on National Affairs in Taipei, Sunday, February 22. DPP heavyweights Sunday, agreed in launching an impeachment drive against the President, in effect upon signing the CECA with China, without reaching a public consensus. Chinese President, Hu Jin-Tao (胡錦濤) conducted a speech, in celebration of the 30th Anniversary of Beijing’s “open letter to Taiwanese compatriots” from December 31, 2008 was conducted in favour of the CECA under the “one China” principle. Hu sees this as an important step towards “re-unification” with China, if Taiwan accepts the political conditions and signs the agreement. Huang debates the issue with various polls, revealing that 60% to 70% of the Taiwanese public opposes the unification, and further stating that Ma’s government is ignoring the public, his Presidential responsibilities – if he allows this to continue on its path. Su Tseng-Chang (蘇貞昌) is the opposition party’s former Chairman. Su criticized the Ma Administration: it had “found the wrong doctors” in attempt to “cure” the current state of economy. He explains further that if in signing the CECA, it would not be helpful to Taiwan, and considering the public opinion, the current economic and financial state – would be highly inappropriate. Su declares the opposition parties and the public taking the matter to the streets if the proposal goes through. Tsai concurs and warns the danger it would involve with the delicate political issues which would cause serious social conflict, if the proposal is carried through without the people’s approval. The Chairwoman believes that the government would pay a hefty price in the launch of the impeachment drive, let alone how the President have to deal with the people. Presidential Office: Sunday, the office of the President dismissed the alarming concerns of the opposition party (as a step towards unification) and insists that the government would consider the nation’s interests as a priority, in relations with China. There is a major conflict with his words, what is really going behind the deals regarding the Taiwan Strait? Li Fei (李非) is Deputy-Director of the Taiwan Studies Centre (< website in Traditional Chinese) at Xia-Men University (< website in English). “It’s a start toward full cross-strait economic integration and a necessary condition for marching forward toward final unification.” quoted the article. The defending Presidential Spokesman, speaking on behalf of the Ma Administration, refers to the agreement as a peaceful attempt to seek a reasonable framework for the normalization of cross-strait economic and trade relations. In regarding on taking initiative in following a public, social consensus, Wang says the government would seek such actions and the government is keen to stay with the ‘Three Noes’ policy. Sunday, according to the Ministry of Economic Affairs (MOEA), the signing of the agreement would be solely based on the frameworks of the World Trade Organization (WTO). 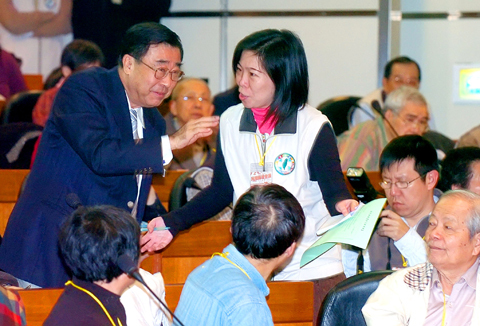 Even during Ma’s Mayorship (Taipei City) was there an attempt to impeach his position. One instance says it all. On February 2006, Canadian preservationist, Curtis Smith, filed a motion with the Control Yuan to impeach the mayor (Ma) and other city officials (here is an example from a past experience, just last month), in dispute over their re-development plan for the 44 South Village (四四南村), a decaying area, built during the early KMT occupation of Taiwan (estimated 50 ago). (Photo, courtesy of Taiwan Review, by Felix Lee) Two neighbouring military dependents' villages in Taoyuan County designated for reconstruction. In such, Smith formed a group, “Alliance to Make 44 South Village a National Relic” (or 四四南村國家古蹟促進聯盟), believed that the Taipei City should restore the 10 buildings that remain in the village. Former residents joined the case for restoration on historical grounds. Former villager, Hsu Cheng-Hu, says, “What culture does Taiwan have left? Nothing. Hsu is firm in his belief in preserving Taiwan’s history culture and identity. Hsu continues in his debate, “In Germany, they preserved the concentration camps. In conclusion, the Taipei City Government agreed with the preservationist group, however, only to a certain extent. Taipei City Hall‘s plan called for the restoration in four of the 10 buildings, and the demolition of the outer six, to construct a local park. Historic Site: According to the Ministry of National Defense (MDN), there had been a total of 888 military dependents’ villages, many of which were located within urban areas. Over 200 in Taipei City when the ROC (Nationalist) troops and their dependents withdrew from China to Taiwan. Upon their arrival, they’ve moved their military bases and families into local homes. The Japanese had built some dormitories for their troops (during their Colonization Era), but there were not enough to accommodate everyone. Instead, the majority of the Senior Officers had taken residence and other dependents were forced to make tents, sleep in quiet corners of temple courtyards or within abandoned warehouses. The hardship lead the Nationalist army to build family quarters – that of which is 44 South Village, among others. The Plan: Taiwan’s National Legislature passed the Statute Governing Reconstruction of Old Military Dependents’ Villages (國軍老舊眷村改建條例) in 1996 to upgrade poor conditioned or abandoned housings for redevelopment of modern, high-rise housing. This held a controversy. What was once an approximate 900 island-scattered Nationalist villages, only 140 remained. The Mainland Chinese communities choose to buy new government-subsidized housing, or accept a compensation package for relocation. As Taipei grows and outspreads its city limits, the number of Chinese are decreasing as they are force to abandon what they have called home for two generations. The decision runs deeper than the urban mixed emotions, it is political. The [then] President Lee Teng-Hui pursued a policy of localization, the reason: it works efficiently as a ploy in preventing veterans [and their families] from voting for the New Party, which had separated from the KMT over Lee’s controversial “Taiwan-first” agenda. Chang Mao-Kuei (張茂桂) is President of the Association of Mainlander Taiwanese (外省臺灣人協會), and Sociologist at the Academica Sinica. “It was a numbers game. “They inflated the numbers to make whoever proposed the amendment look bad,” while “the people who proposed [the additional amendments] could not” explain why they were called for, nor explained the budget. “To my knowledge, some of those veterans may have already received housing subsidies for not living in Juan-Cun.” explains Chang. In Article 2 of the San Francisco Peace Treaty (SFPT), Japan renounced all right, title and claim to Formosa and the Pescadores. Due to the fact that neither the Republic of China (ROC) nor the People’s Republic of China (PRC) was among the signatories of the San Francisco peace treaty, in the Japan-China peace treaty signed on April 28, 1952 (when the San Francisco Peace Treaty came into force), Japan reiterated that it recognized that under Article 2 of the San Francisco Peace Treaty it renounced all right, title, and claim to Taiwan (Formosa) and Penghu (the Pescadores) as well as the Spratly Islands and the Paracel Islands. Japan renounced its right, title and claim to Taiwan, but it did not mention to whom it relinquished Taiwan. Neither the ROC nor the PRC was among the signatories of the San Francisco peace treaty, and the rights of China were explicitly defined in a separate article (Article 21) of the treaty. Clearly Japan did not turn over its rule of Taiwan to the PRC or the ROC. When the Japan-China Peace Treaty was signed, the San Francisco Peace Treaty had already come into force. This means that in the Japan-China peace treaty, Japan could not re-relinquish territory it had already disowned in the San Francisco peace treaty. For this reason in the Japan-China peace treaty, Japan made its renouncement in accordance with the San Francisco peace treaty. In other words, according to the San Francisco Peace Treaty Japan renounced its right, title and claim to Taiwan, but did not specify to whom the territory was handed over. Since it had given up its rule of Taiwan, Japan no longer had a say-so concerning dominion over Taiwan. This is the legal grounds for the argument that Taiwan’s status has not been determined. It also sets the parameters for how Japan deals with issues pertinent to Taiwan’s status. (Photo, courtesy of daylife) A Taiwan demonstrator wraps his head with a "Taiwan Republic" flag during a flag raising ceremony sponsored by the pro-independence Taiwan Republic Movement, Monday, Sept. 8, 2008, in Taipei, Taiwan. The group has campaigned to declared September 9 Taiwan's independence day to mark the 1951 San Francisco Peace Treaty, under which Japan renounced its 50-year colonial rule of the island. The San Francisco Peace Treaty between Japan and China changes everything. With this knowledge, as all Taiwanese politicians share, there is one question that begs to be asked: What are we doing with the Cross Strait relations? Taiwan was not part of China once century ago upon the arrival of Sun Yat-Sen, not was it part of China in 1947 when the R.O.C. (Republic of China) government crossed over with Chiang Kai-Shek (CKS), nor during the time of or post-Japanese Colonial Era. Despite the 1895 Treaty of Shimonoseki where it states that Taiwan was ceded to Japan from China, was due to a minor misunderstanding, which history books will not reveal – lets just call it, a secret history from the generations. Upon the arrival of the Japanese, obviously foreign to the local language, looked to the next biggest land for political rights and reference. China, being more than happy to obtain currency through negotiation with Japan, agreed to surrender the rights of Taiwan. One understands – any country must consider the majority as well as recognize the minority. In this case, the Taiwanese and Chinese are the majority. The island is governed by two political parties: the Chinese Nationalist Party (or Kuomintang, KMT) and the Democratic Progressive Party (DPP). The wide-spread use of Mandarin has been adopted nation-wide, the people have become Chinese-friendly, recognizes Chinese culture and welcomes mainland tourism. The point I’m trying to come across can be broiled down to one simple question: What do you mean by “return to China” or being a “province of China“? There is indeed a greater possibility of holding significant relations with China, if it was not for the territorial claims and their alarming threats (missiles). There are many who believe, if these were never an issue, Taiwan and China would hold diplomatic relations and still hold membership within the United Nations (UN). On the other hand, let us consider one of the minorities of the island: the Japanese. Why do we not hold similar perceptions with them? Perhaps it may be due to the frequent assistance, trade and political nature between the two nations. Perhaps, it could be that Japan had never attempted to reclaim Taiwan nor made any statements in doing so. What is the main issue at hand, that leads us all to such complicated ties? Why is Taiwan a better partner for the island than China? Present research in the internationally recognized laws of war (such as the laws of military occupation), suggests that Taiwan’s referred “permanent poluation” may be a case of mistaken identity. Since the century-long occupation of the Chinese in the island, the issue of identity crisis, for both sides, rose greatly by the numbers. 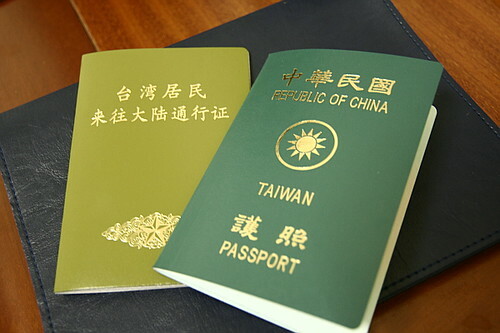 The researchers involved, suggests that the legal basis for recognizing the Taiwanese in holding ROC citizenship, is greatly debated to serious doubt. 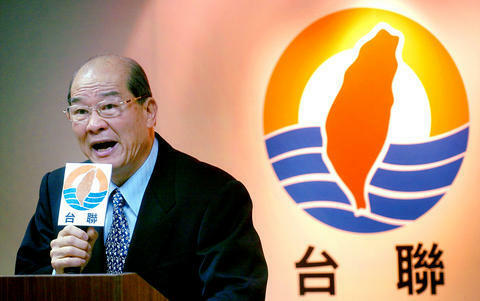 (Photo, courtesy of China Economic Net) Japanese Prime Minister Yasuo Fukuda said on Friday, May 02, 2008, that Japan does not support Taiwan authorities’ attempts to seek UN membership through “referendum” and moves that may change status quo of the cross-Strait relations. Under the customary laws of warfare, upon the surrender of Japanese troops the local populace in Taiwan will pass under a “temporary allegiance” to the conqueror, which in the post-Napoleonic era will be the principal occupying power. Moreover, the doctrine of “temporary allegiance” only exists in a single-tiered formulation. The historical record clearly shows that the United States was the “conqueror” of Taiwan, not the Republic of China. In the General Order No. 1, General MacArthur gave directions to Chiang Kai-Shek of the Republic of China to accept the surrender of Japanese troops in Taiwan. The Generalissimo accepted these orders. The surrender ceremonies mark the beginning of the belligerent occupation. The United States is the “conqueror“ and the “principal occupying power.” The Republic of China military forces are merely a “subordinate occupying power” under the USA. Although there were some prolamations made in 1945, the most commonly quoted reference for the “legal basis” of native Taiwanese persons as having ROC nationality is a January 12, 1946, order issued by the ROC military authorities. However, that order was never ratified by the Legislative Yuan, nor made into a law. Importantly, as “belligerent occupation” of Taiwan began on October 25, 1945, with the surrender of Japanese troops, and only ended with the coming into force of the San Francisco Peace Treaty (SFPT) on April 28, 1952, such an order is prohibited. More specifically, the imposition of mass-naturalization procedures over the civilian population in occupied Taiwan territory is a war crime. Reference to the pronouncement of the US government, the British government, etc. in the late 1940’s (and even into the 1950’s) confirms that the leading Allied nations never recognized the legal validity of the mass naturalization of native Taiwanese persons as “ROC citizens” by the Chiang Kai-shek regime in the 1940’s. Notably, Article 4 of the ROC Constitution specifies that “The territory of the Republic of China within its existing national boundaries shall not be altered except by a resolution of the National Assembly.” In regard to the alleged incorporation of Taiwan into Chinese territory, there is no resolution of the National Assembly on record. Moreover, international law specifies that “military occupation does not transfer sovereignty.” The proclamation of “Taiwan Retrocession Day” on October 25, 1945, thus indicating a clear intention and objective to annex Taiwan territory, is a war crime. *Article 26 of the SFPT serves to authorize the drafting of a peace treaty between the ROC and Japan. Article 10 of the Sino-Japanese Peace Treaty (Treaty of Taipei) of August 5, 1952 specifies: “For the purposes of the present Treaty, nationals of the Republic of China shall be deemed to include all the inhabitants and former inhabitants of Taiwan (Formosa) and Penghu (the Pescadores) and their descendents who are of the Chinese nationality in accordance with the laws and regulations which have been or may hereafter be enforced by the Republic of China in Taiwan (Formosa) and Penghu (the Pescadores)….”The ROC Nationality Law was originally promulgated in February 1929, when Taiwan was a part of Japan. It was revised in February 2000, however there were no Articles addressing the mass naturalization of Taiwanese persons as ROC citizens. Hence, the conditions of Article 10 of the Sino-Japanese Peace Treaty in regard to “in accordance with the laws and regulations which have been or may hereafter be enforced by the Republic of China in Taiwan….” have yet to be fulfilled. For native Taiwanese persons to be bona fide ROC citizens, two conditions would need to be met. First, the SFPT would have to award sovereignty of Taiwan to the ROC and second, there would have to be a law passed regarding these mass-naturalization procedures, after the peace treaty came into effect on April 28, 1952. In fact, neither of these two conditions has been met. Importantly, the ROC Constitution does not clearly define its own “territory.” By contrast, the Constitution of the United States specifies the inclusion of the original thirteen states, as well as additional states which have entered the Union via acts of Congress. In regard to territories over which other countries have relinquished sovereignty, and which have come under the jurisdiction of the United States, there are treaties which give the full specifications. The “Republic of China” Constitution currently in use in Taiwan was passed on December 25, 1946, when the Chinese Nationalist Party (KMT) still ruled China. It was promulgated on January 1, 1947, and came into force on December 25, 1947. It was brought over from Mainland China by the KMT during the Chinese Civil War period of the late 1940’s. During this period of time, Taiwan was under military occupation, and had not been incorporated into Chinese territory. As such, this ROC Constitution, which is often called the “Nanjing Constitution“, is not the true organic law of the Taiwan cession, and all relevant articles regarding “the people of the ROC” cannot be interpreted to apply to Taiwanese persons. With no clear leagal basis to include “Formosa and the Pescadores” (aka Taiwan) in its definition of “national territory,” and no international treaty references which can be found, it is extremely questionable to say that the ROC Ministry of the Interior is the “competent authority” to issue ID cards to Taiwanese persons, or that the ROC Ministry of Foreign Affairs (MOFA) is the “competent authority” to issue passports to Taiwanese persons. The military government of the principal occupying power does not end with the coming into force of the peace treaty. To date, no record can be found of a formal announcement of the end of United States Military Government in Taiwan. Under such circumstances, the subordinate occupying power ROC’s enforcement of mandatory military conscription policies over the native Taiwanese populace in occupied Taiwan territory from the early 1950’s up to the present is a war crime. March 26, 1895 marks as the First Sino-Japanese War. Japanese forces invade and occupy the Pescadores Islands off Taiwan without casualties. In not one of the legal documents (nor the General Order No. 1 on Sept. 2, 1945), or ceremonies held upon the Japanese’s surrender held in Taipei, in October 25, 1945 – could signify any means of transfer of sovereignty over “Formosa and the Pescadores” to the ROC government. The “Republic of China on Taiwan” lacks the permanent population necessary to be formally and internationally accepted as an independent sovereign nation. (Photo, courtesy of china-un.ch) Since the Joint Communique between Japan and the PRC, their relations have since been affirmed and celebrated to this day. The peaceful relations between Taiwan and Japan, is in thanks to the 1972 Japan-PRC Joint Communique. Since the Joint Communique, Japan has maintained non-political, economic relations as well as private exchanges, with Taiwan and does not recognize the ROC government as an official government, hence having remained to referring the island as simply, Taiwan. There was a pre-condition, however. Japan abrogated the Treaty of Taipei in relation to the non-recognized Taiwan polity (at the time). The SFPT is the underlying cause to the complications within the political status of Taiwan and the ability made possible for the long reign of the ROC government over the island. Currently, Taiwan is an occupied territory of the United States, and Taiwan’s statehood status is disputed and uncertain. Neither the SFPT nor the Treaty of Taipei nor any other subsequent legal instruments changed the status of Taiwan. The United States as the principal occupying power is still holding the sovereignty over Taiwan and title to its territory in trust for the benefit of the Taiwanese people. The principal occupying power never transferred the sovereignty over Taiwan or title to its territory to any other government. The international community does not recognize Taiwan as a state. The United Nations never recognized Taiwan as a state and has never granted Taiwan’s application for membership. Treaty of Peace: Since the ROC nor PRC were invited to attend the San Francisco Conference nor the San Francisco Treaty, the ROC in conclusion, created a separate Treaty of Peace with Japan in 1952. 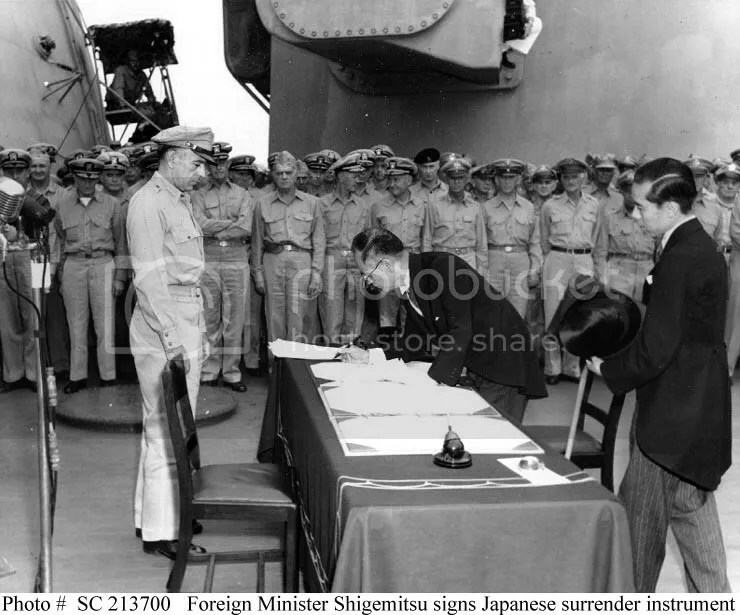 (Photo, courtesy of Japan Society) Second Treaty For the Japanese, is the SFPT, signed-in-effect on September 8,1951 in San Francisco, California, United States of America. (Photo, courtesy of history.state.gov) Chinese Revolution of 1949 in Beijing, China. There is a price when you hurt someone’s pride or make them lose face, however, it is soundly lethal, with a country. Why would China make such claims? According to dated history, the Han Chinese first settled in the islands of Penghu in the 1200’s, however at the time was doomed as unattractive due to the local hostile tribes and lack of trade resources. This was during the ancient China’s time of the Three Kingdoms period (third century, 230 A.D.), or aka, Three Countries in the Mandarin language. The most notable immigration of the Chinese and the Imperial Chinese rule was when the forces of Southern Fujian came to defeat the Dutch in 1662, lead by the general Zheng Cheng-Gong, whom is as well referred to by his nickname, Koxinga. In the end of the Ming Dynasty, as a means of protest and revival of the Ming Dynasty rule, did Koxinga retreat to Taiwan with like Ming followers and have since, established the *Kingdom of Tung-Ning in what was then called, Formosa. Koxinga was the first and only emperor of the island. (Photo, courtesy of panoramio) State of Zheng Cheng-Gong (or Koxinga), located in Fujian, China. The Betrayal of the Kingdom: Koxinga’s work and efforts had all failed with the defeat of his grandson to Admiral Shi Lang in 1683, during the Qing Dynasty (of China) – and thus, formally annexed Taiwan, placing it under the jurisdiction of Fujian province. The Qing Dynasty government held control over the island through the issuing a series of edicts to manage immigration and aboriginal land rights (please refer to here, for related, “Taiwan Aboriginal Rights“). They continued to immigrate people of Southern Fujian to promote and keep the rule, therefore created the first identity issue. In 1887, the Qing government had decided to upgraded Taiwan’s status from prefecture to a full province, or state, of Fujian, China. Imperial Japan disrupted China’s rule in 1592 by Toyotomi Hideyoshi. May 25, 1895, a group of pro-Qing followers claimed the Republic of Formosa to resist the Imperial Japanese rule, however had been defeated [pro-Qing followers] on October 21, 1895. October 25, 1945, the troops of the Republic of China accepted the formal surrender of the Japanese military in Taihoku (once a prefecture, now the Control Yuan, located in Taipei City) and was since lead by CKS, under Chen Yi (which from his rule [Chen], became very unstable and corrupt, hence the often referred image of the KMT). Since the conquer of the ROC government, the flow of Chinese immigrants to the island, had resumed, notably in 1949 upon the defeat in the Chinese Civil War. Since the 2-28 Massacre, many problems arose, compounded with hyperinflation unrest, distrust due to political, cultural and linguistic differences between local residents and the Mainland Chinese – lead to the new Taiwanese’s support for a new government. Since 1949, the island has accumulated a snow-ball series of severe clashes between two political parties between the government (KMT) and the Taiwanese (DPP) in reference to the 228 and the reign of White Terror. From this period, up to the 1980’s, the island was governed by a party-state dictatorship with the KMT as the long-standing ruling party, allowing the continuance of military rule – which disrupted any possible distinction between the government and the party – with public property, government property, and party property being constantly and freely interchangeable. At this time, education, government work and media were all required to pledge their allegiance tot he KMT party. Any other parties, separate from the ruling party, were outlawed and the opponets, persecuted, incarcerated and executed. “Temporary Provisions Effective During the Period of Communist Rebellion” was what Taiwan was named under, in effect of the new government, from 1948 to 1987, when former President, Lee Teng-Hui liberalized the island with an introduced democratic system and the idea of sovereignty. Former President Lee created the group, Taiwan Solidarity Union, or TSU. (Photo, courtesy of Xinhua, by Wang Yong-Gji) Mainlander, Zheng Jian, 81, born in Southeast Taiwan, posts a letter (from China) to his Taiwanese relatives at the ceremony marking the start of direct postal services between the Chinese mainland and Taiwan, in Beijing. Photo is dated to December 15, 2008. Despite the mainland-Chinese ruling system, the two parties held one similar belief: anti-Communism. Since the late 1970’s, technology had a revolution in Taiwan, kept-up with Japan (no. 1) and holds a ranking of no. 2, helped with national finance and together with the engineering the Japanese had provided, the island grew independently rich once more. Facts are an important factor and apparently seems to be what’s missing from the Taiwanese people, new-Taiwanese and traditional, even students. What factors have changed? Currently, there is an appeal to bring the case of Taiwan’s Independence to the Supreme Court in the US. As the recent warming within the Cross Strait opens new doors, yet remain just as fragile still – current President, Ma Ying-Jeou is taking gradual, precautionary steps to rebuild relations between the two sides, in hope for a compromising win-win situation. Chinese and Taiwanese relations have been ascending over the past century. What Chinese tradition and fortune will tell you is that the hair cutting business is of one called, “golden bowl,” an old Chinese term, meaning there will always be a continuous flow of income. (Photo, courtesy of CNA) NTD $100 haircuts are gaining in popularity throughout Taiwan. Shops that offer NT$100 (US$2.9) haircuts are seeing a sharp increase in business, as more people are trying to cut back on spending in a difficult economy. Photo, taken in Taichung. What is better than a USD $5.- haircut? How about NTD $ 100 (USD $3.-)? No kidding! It’s not the latest crazed fashion, but a bigger demand in current struggling financial times. In Taichung City of Taiwan, one may find at least one NTD $100 barber shop in the local hypermarts. The value-for-the-money not only held reliable clientele, but have recenlty brought in more, coming by the numbers. Affected by this business, other local salons offer the same deal to keep their business. Indeed, cutting the hair and dusting the house following the Chinese New Year is a well known and practiced tradition that has continued for thousands of years. The missing fourth floor. 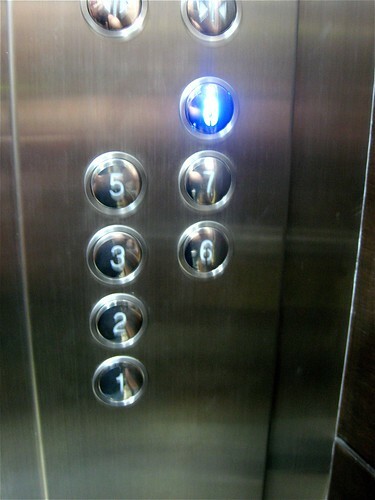 Four, in Chinese culture is associated with death, where as eight (lighted elevator button), is associated with good fortune. Why not? Do you know that you’re not suppose to wash your hair on that day? The belief is that it would wash away your good fortune for the year to come. The practice of cutting hair is to discard and leave-off the bad luck from the previous year. Tradition also says to spend money in even numbers because odd numbers (in cash) are associated with funerals. $ 100 NTD sounds even enough for me! "A great fortune depends on luck; a small one on diligence" －goes the Chinese saying. The average Chinese prefers the easy way to prosperity: leave it to fortune, but never push you luck! Good fortune favors a clean house, so the family welcomes the Spring Festival with a complete spring-cleaning, a big sweep to do away with all misfortune. All sweeping is done by New Year's Eve. 1. Buying books is bad luck because the character for “book” (書/书) is a homonym to the character for “lose” (輸/输). 2. Offering anything in ‘fours,’, as the number four (四), pronounced sì, can sound like “death” (死) in Chinese. 3. Buying a pair of shoes is considered bad luck. The character for “shoe” (鞋) is a homophone for the character 諧/谐, which means “rough” in Cantonese; in Mandarin it is also a homophone for the character for “evil” (邪). 4. Getting a hair-cut in the first lunar month puts a curse on maternal uncles. Therefore, people get a hair-cut before the New Year’s Eve. 6. Sweeping the floor is usually forbidden on the first day, as it will sweep away the good fortune and luck for the new year. 8. Talking about death is inappropriate for the first few days of Chinese New Year, as it is considered inauspicious. 9. Avoid clothes in black and white, as black is a symbol of bad luck, and white is a traditional Chinese funeral colour, or death. 10. Foul language is inappropriate during the Chinese New Year. There is superstition in hair, and even nails!! A three-year-old ABC (American-Born-Chinese) is biting his nails. Generally, this is psychologically and socially accepted as a habit stemmed from anxiety, stress or social pressures. Nail Cutting: the discarded nails should not be left for evil spirits to find, a lucky place to bury them is said to be under an ash tree. Some families go to the extent of not cutting their infant’s nails until past their first year of life. Instead, the mother would bite them to prevent the coming of evil spirits. Hair-Cutting: This became a culture of superstition because the Westerners, centuries ago, believed one’s hair as the person’s inner strength, as in the story of Samson and Delilah from the Christian Bible (< speaks about the virtue of hair, in the bible). The first gathered locks from the infant’s first cut was carefully preserved from witches and past infancy, the discarded hair strands were to be burned to guard against unwanted spirits. There were rules to this matter. The hair should not be shaken out into the garden, as it is believed that one would endure headaches if a bird shall come upon the strands and weave into a nest. Once this occurs, the only cure to come by is through the destruction or deteriation of the nest. Funny Fact: some of these superstitions derived from North Africa (such as Egypt), however have since been more lenient from Mohammad‘s time. I was bound to get down to the centre of business and interview barbers and get a perspective into this matter. I remembered having passed through Shuang-Lian MRT station and seeing the hair cuttery (barber shop), this became my destination. 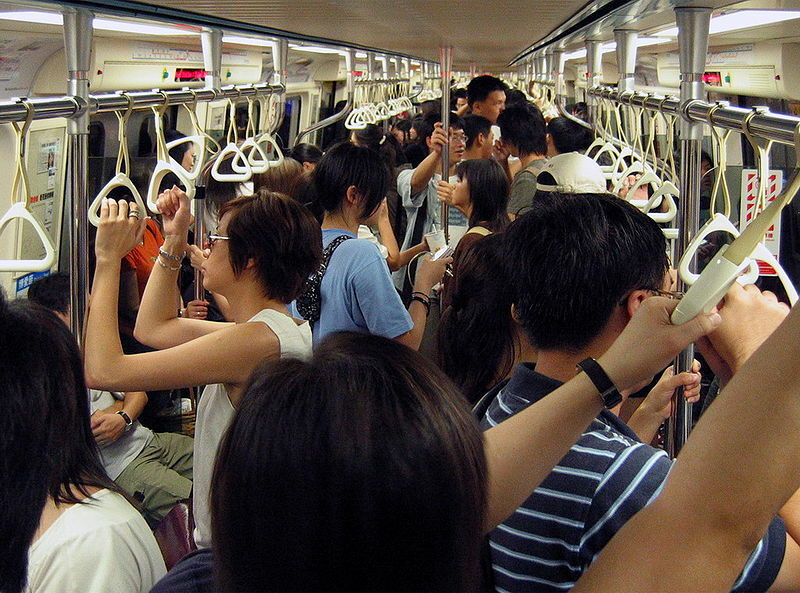 (Photo, courtesy of wikipedia) Inside the MRT from Taipei Main Station. First thing’s first: why do we cut hair? To keep-up with a neat, organized look. To follow in accordance with the changing climate or seasons. To adjust ourselves to the current market trends. To change current ‘look,’ in effort to feel refreshed or anewed. On average, each human carries 100,000 hair follicles. The hair grown from our scalp, however, do not grow in unison, as they do in newborns. Those of us who have attempted to grow our hair out past a certain length, are all too aware of this fact. What’s funny, is that if they were to grow in unison for our entire lifetime, we would all fall to become bald! (Photo, courtesy of pg.com) Electronmicrograph showing new hairs emerging from the hair follicles of the scalp. What may appear to us as random falling of hair strands, is really a controlled pattern. To this day, the answer to this mystery is still unknown – but nonetheless puzzling. Hair grows, on average, 1cm per month, therefore 12cm a year and 60cm in five years. Waist-length hair is around 80 – 90cm long, given the variation in length of one’s waist and placement of the hips. Shoulder-length hair, from scalp to shoulders’ base, takes three years, at this speed. Why do we cut more during the summer? Easy: because it is hot. Why do we cut hair during the winter? Because the rate of growth and shedding increases! With some elderlies, the hair growth-cycle, may be shorter. The follicles give up their attempts to grow up to their potential lengths, and thus becoming thinner and shorter. Social Value: Little do we know, back in the times of ancient Egypt, the royal servants of the court would tweeze every single strand of hair on the Pharoh’s head and body. Ouch! Currenty trend among the women as the popular Taiwanese singer and actress, Rainie Yang, depicted in the photo, here. Following [below] are seven defined social values of hair throughout history. 1. The quality of hair signifis one’s genetics and state of health (hair growth stops with anorexia, and body hair becomes thicker and greater in numbers with buhlemia). 3. Male pattern baldness, is as well associated with age, but in old Chinese culture, is to signify a successful business man. 4. Certain religious groups allow certain lengths or manner of hair. Back in ancient China, varying from the changing dynasties – the style of hair and length would vary just as well. The last dynasty of China, the Qing Dynasty (16th to 18th Century), the Emperors lead the society to follow the style of the queues (after the Manchu [Mongolian] conquer). 5. Regular hairdressing, in some social circles may signify one’s amount of wealth or social network. 6. The African-American afro was a symbol of racial pride (unique texture of hair, limited to the African decendents). 7. In the 1920’s America, the bob-cut was a symbolism of female independence and sexual freedom. (Photo, courtesy of yours truly, dated to Thursday, February 19) NTD $100 Hair Cuttery, located within the MRT's Shuang-Lian Station. In the photo, Barber, Jason, works on a long-time client. In the interview, I had the privlidge of speaking with two of the three Barbers of the cuttery. Lan: How long has this hair cuttery been in business? Sam Zhu: This location has been openned sincee October of last year (2008). Lan: Tell me about your business? Jason: Since we’ve openned, the business started out with an average of 20 – 30 customers a month, whereas today, it has gone up to 20 – 30 a day! Lan: Have you heard from the news that due to the financial crisis, people are turning to hot-deal barber shops, such as this one, in search for the best deal for their money? Sam: Yes, I agree. The owner of this business was influenced from travels in Japan, Hong Kong and Singapore, where they have already started with the same idea. I am one of the senior staff members here, and from what I’ve seen, business have picked up late last year to what I believe could be in affect to the financial crisis. Jason: Yes, I believe that much from our business is in due to the financial situation. Our regular clients have grown, however, in part due to reference, or word-of-mouth. Lan: What are your average customers? Jason: Definitely men. They like to keep their hair short, or up to date with trends. As for women, I would say about 30%. As we all know, they enjoy having long hair. I can say for women with shoulder-length hair, or longer, may come in once every two to three months. Barber, Sam Zhu, greets customers in queue to purchase their ticket. Lan: Other than your speed of service, how does your cuttery set apart from others? Sam: We have three staff members at hand so there is an efficient turn-over, and less of a hassle for customers in waiting. Also, we offer a ticketing system! You insert a NTD $100 bill, and out comes a ticket with a given number, but usually one does not require waiting. Lan: I see, this is unique, and certainly attractive for business! Both: Yes. Yes. It has worked well for our staff. Lan: Tell me what NTD $100 offers the potential customers. Jason: The amount is good for ten minutes, however I have not seen a situation where it has exceeded NTD $200. Because we provide the service for customers’ convenience, we do not offer straightening, perms, hair-wash (shampoo) or colouring. Lan: Is there a website one way visit, in reference to your service? Lan: Thank you both very much for your time. I wish you all great, continuous success in your business. Barber, Sam Zhu is skillfully at work with his client, Kevin, as others (behind, left) are coming in queue to purchase their tickets. A read that placed a smile on my face, I will simply call it, “Only in Taiwan,” via TravelPod.com. Taiwan's based manufacturer, High Tech Computer (HTC) Corporation logo. When Taiwanese handset maker, High Tech Computer (HTC), unveiled the third phone based on Google’s technology, the internet giant has fallen determined in their bid over the mobile phone operating software market on Tuesday, February 17. At the moment, the touch-screen HTC Magic has been sold-off by the British network operator, Vodafone. Competitors are battling against time and technology in creating a more dominant operating system for mobile phones with Google and its Android system (more information here). One of the top companies to beat is the long-standing software giant, Microsoft, handset maker Nokia, open-source Linux-based project as well as Blackberry; the competition is tough to beat. Days of rivalry are numbered! As the technological devices get smaller and screens get bigger, there begs to be something different in the market. (Photo, courtesy of Fast Company) John Wang, HTC chief marketing officer -- AKA Chief Innovation Wizard -- talks about how his company does its magic. John Wang is the Chief Marketing Officer of the Taiwanese phone maker, HTC. “It’s got to come from the heart,” says Wang. It is how you get a launch in the industry, how you sell, and the only way to get the best of ideas. Though smart phone specialist have since launched two new phones: the Touch Diamond 2, targeted to the consumer market; and the Touch Pro 2, for business users. According to Wang, the people do not want a pretty face over the technology, they want all the technology beyond the screen, buttons and shell. This is what Apple has exposed as the key in mobile internet and such services, it is all about: the user experience. According to the mobile phone industry statistics, people do not want their phone to get more complex or powerful, most of the surveyed are not capable of using half the built-in applications. What do the consumers want? HTC is determined, they are offering a hott, but simple technology. It is, of course, the secret behind Apple’s success after all. “We have tried to apply technology not to make things more complex, but to simplify. And we have tried to make browsing the Internet from your phone a less terrible experience,” Wang explains. The heart of the idea is what HTC calls, “push-Internet,” introduced Monday, February 16. From the exposure, much is to be expected from this technology as it is to ship in Europe by the end of the second quarter. Key point: no one likes waiting on the internet. The phone will download the information at regular intervals from the internet, therefore ready at moment’s will, with just a simple push of the button. “It’s almost like having a conceirge that would go and get your newspaper every morning,” says Wang. Another key feature is the layout of information: under each contact, users will be able to view threads of e-mail and text-message history as well as records of in-person meetings or phone calls. “It works more like the human brain (Interesting read on the computer in comparison to the human brain). When I think about Steve, and I want to find a restaurant he told me about months ago, I would rather search under his name than have to dig through the individual applications: e-mail, text message, etc.,” Wang explains. As impressive as the technology sounds, however, it may surprise you to find that none of these announcements are revolutionary; they are not doing anything new. The technology, instead, allows the user to make use of their technology, efficiently. 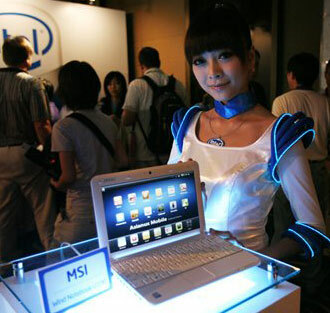 (Photo, courtesy of the Associated Press, by Wally Santana) A model display's a MSI laptop containing Intel Corporation's new "Atom" chip at Computex Taipei, the biggest information technology trade show in Asia, in Taipei, Taiwan, Tuesday, June 3, 2008. In February 2008, mobile phones are more widely accepted as mini-computers, known as smart phones. Apple’s raving iPhone (lists all the problems with the phone) is one of the most prominent examples, however Taiwanese technology is making its way to beat the Apple company. Taiwan’s very own IT industry is changing. Taiwanese companies are in a revolution of coming out to be recognized with their own lines and with an advantage: Taiwan has the technology. (Photo, courtesy of HTC) Debut brings breakthroughs in size, style connectivity and overall user experience, leaves compromise at the door. Peter Chou is the co-founder, CEO and President of Taiwan’s most aggressive starters of the HTC Corporation. The company offers premium levels of mobile phones, built under contracts to Sprint, Vodafone and T-Mobile, have become the standard under the executive gear globally. If that is not enough, the Taiwanese handset manufacturer is redefining its household name in prestige cell phones. Wang, the Chief Innovation Wizard, says: The only way for a company to succeed beyond its own success, is to be the BMW of the industry. CRAFT: The touch-activated handsets are Microsoft-based and has adopted Google’s android platfrom since their alliance. The company’s sole focus is on the cutting-edge high-end products – like BMW: it is not the biggest, but it is the leader and has earned the international recognition and reputation for being the leader of the industry. One cannot get to the top, without offering the best, it is what people want. CRAFT: Smartphones were still within their infant-stages, but in a few years when smart phone and blackberry technology will find themselves in an exploited situation. It’s all that either line will have to offer and like technology, the consumer always wants the best and continuously improve themselves. At the phone's launch, Vodafone's Patrick Chomet called it the "the thinnest, nicest Android-powered device on the market." August 2007, Taiwan’s HTC beats Apple’s iPhone to Japan. The secret weapon: a touch-screen handset that is safe with NTT DoCoMo‘s 3G network, begining in early 2008, last year. The H1100 is soundly superior to the iPhone: not only can it zip heavy video loads at speeds of 3.6 Mbps, but is compatible with the various cellphone standards around the world, such as GMS, GPRS and W-CDMA. It’s Windows Mobile 6 operating system doesn’t hurt either for personal or business users (this are key weaknesses to the iPhone). Steve Shih Chen is the Co-Founder and CEO of YouTube. (Photo, courtesy of CNA) Steve Chen (center) is welcomed back to his former school, the Chingshin Elementary School in Taipei, June 11, 2007, by Principal Chien Yu-Ling (left) and young students - during his Taiwan visit, in discussing Web2.0. Chen’s beginnings was as an employee at PayPal, where he met Chad Hurley and Jawed Karim – all three whom created YouTube in 2005. What many do not know, is that for a short, brief period, Chen as well worked as an employee for Facebook, however left in due to YouTube’s launch. June 2006, Chen was decorated, by Business 2.0, as one of “The 50 People Who Matter Now” in business. How is YouTube relevant in this report? October 16, 2006, Chen and Hurley, two of three of the company’s founders, have sold YouTube to Google, Inc. for USD $1.65 billion. “When we met with (Google CEO) Eric Schmidt, and this was the day before the acquisition was going to be announced, the question was, ‘what priorities do you want us to concentrated on?’ ” Chen said. “The mandate was that if you have happy users and have great content, that monetisation and working with advertisers will always come later. The Creation: At a dinner party in January 2005, Chen and Hurley agreed: there was no available efficient method to share an online video or photos. At the time, they were between jobs and living off of credit cards – then, there was the launch of YouTube in February, and it’s official launch in December. “Only YouTube created a new way for millions of people to entertain, educate, shock and grok one another on a scale we’ve never seen before,” enthused the editors of Time Magazine. 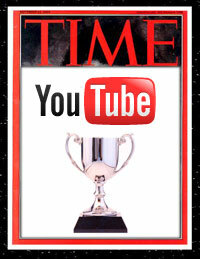 “The rules are different now, and one Web site changed them: YouTube,” said the editors. Taiwan’s Hero: The Taiwanese-American has become the pride of Taiwan. In the beginnings, Chen had to give up his dreams of education for the work field, lived off of credit cards, and started a business in a Silicon Valley garage. With over seven million visitors a day, YouTube is the hottest site on the internet, gaining much respect from the mainstream American media. As an example, Mtv with its USD $12.5 billion advertising industry is contemplating how to partner with the website. (Photo, courtesy of TAIPEI TIMES, by Liao Chen-Huei) YouTube co-founder Steve Chen smiles while delivering a public speech at the Taipei International Convention Centre Saturday, June 9, 2007. In early June of 2007, Chen returned to his homeland of Taiwan, in speaking at Economic Daily News for the paper’s 40th Anniversary. Everyone wanted to know how the [then] 29-year-old created the site in a garage, that could very well have taken on Google. Very well said for someone with credit card debt, no college-graduate degree – and all having sold very wisely, in perfect timing to its very own rival: Google. Before the website it would take up to three to five days to upload videos, and some sites screened the videos as a mandatory step in the process. It was in all, a very frustrating and unpopular experience – Chen and Hurley’s video-sharing site changed history and the internet forever. He had just bought a house, while being in between jobs; the equipment and broadband connections required for the video-sharing site held a price: USD $50,000. Thus explaining the substantial debt he carried. Fortunately, the faith and timing in the market was accurate and the attention among internet users spread like fire. Just a mere 15 months after its debut in 2005, the site had attracted six million visitors, 65,000 home-made video clips and over 100 million clip viewings – standing as a giant over similar video sites as Microsoft and Google. Sequoia Capital took an interest and invested USD $11.5 million and have since turned the two-man company into one with 25 employees. (Photo, courtesy of australianit.news.com, by James Croucher) Steve Chen, CTO and founder of YouTube, at Google's office in Sydney on March 19, 2008. Chen is obviously, no longer in debt – as a matter of fact, is a recognized [overnight] multi-millionaire. He was named one of the “100 Most Influential People In The World” by Time Magazine and the 28th “Most Powerful Business Person” by the Industry Journal Business 2.0. The lists goes on, but one more I must insist on mentioning: Chen was awarded a “Person of the Year” award at the Webbies, or the “Oscars” of the World Wide Web. Even Oprah had a say. Is it luck? He even said that 20 years ago, when told by a Taiwanese fortune teller that he’d never be wealthy – never imagined he could gain such honours. It was all luck, Chen said modestly: 2005 just happened to be the year when the concept of “Web 2.0,” sharing and interactivity, took off; online video technology was in bloom and high-quality digital video recording started its popularity. These factors and the partner involved, was the ideal for their success.